Attempting to pin down and describe the TEAM Experience is a very hard task indeed: In my voluntary role as Assembly Production Assistant, I've had the chance to tour Wales' communities, meet interesting people, and fill a wide number of different, vibrant and challenging roles. I've had experiences I never thought I would have. I've watched ballet in a bus station in the dead of night and I've been up and down on a funicular railway handing out seaweed. I've sat between an engineer and a tween pop-star in the making, learning how to make a boat out of last week's Western Telegraph, a handful of elastic bands and three milk cartons. I've helped cover Theatr Brycheiniog's entire stage with turf in preparation for a surreal indoor picnic. I've played with toy cranes in a former bank and I've witnessed an artist cook up his own shoes as part of a Live Art Speed Dating event in an empty shop. I've learnt so much, from a general geographical knowledge of the country I live in to personal stories from the people who live just half an hour away from my house. The Assemblies have all been so different, yet are linked by the fact they all provoke interaction and so a lot of my work has been about finding out about what matters most to a community, and encouraging a dialogue between theatre and community, and between individuals within a particular corner of Wales who would not usually come together. I've seen enough eye-opening ideas sketched on blackboards this year to make me question whether I ever left primary school. 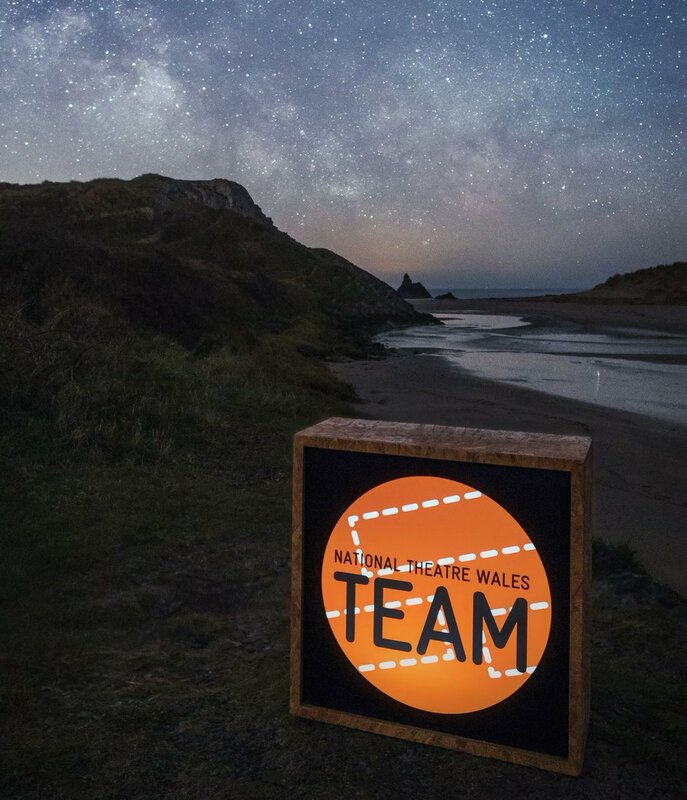 I got involved in TEAM after joining the group on this community, not quite knowing what it was but curious about how I could get involved with National Theatre Wales' work. What I eventually discovered was an extraordinary opportunity to expand my own experience and enjoyment of arts. Working closely with Creative Associates Mathilde Lopez and Catherine Paskell, I gained a real insight into how the theatre works, giving me chance to expand my understanding of theatre and develop ideas regarding what role suits both my skills and my passions. Motivated by an environment where innovation is encouraged, I have had chance to broaden my experience through training, shadowing and experimentation. Throughout the year, I have picked up new skills in both formal and casual ways. I undertook training in online marketing and general leadership as well as picking up more specific skills in technology and stage management through shadowing. There have been moments where I felt I could do better, but my experiments have largely enabled me to to find my own 'voice' and see my work experience as a chance to learn from my mistakes with the security of constant support and guidance. Overall, TEAM has provided me with a wonderful opportunity for development, which I consider myself so fortunate to have had. Yet it is not just me that has been developing. Working with a new company, I did get the sense that I had become part of an alive, creative process with an organisation that is also trying out new ways to (re)present theatre in Wales. I am sure that I've benefited from working with a company that is still exploring innovative ways to represent a country in a really inspiring time for theatre to reach a wider audience in this country. Yes, the experience has most certainly been tiring. From early morning mountain climbing to late night toy boat painting, the working days are so erratic. In fact, join TEAM and the only 9-5 you'll ever come across is that of the Dolly Parton variety as you sit crammed into a car from Aberystwyth to Cardiff in a reluctant sing-along. For me, TEAM has certainly been hard work but I've found it impossible not to get swept away by the creative mood, surrounded by people who are passionate about what they do. In a time where most arts organisations are cutting back and restricting who they take on, the TEAM programme is refreshingly inclusive. Like me, many of my fellow TEAM members are trying to gain more experience before starting a career in arts but there are many others who have a passion they want to bring to the company but who would never usually go near the theatre. We're not only the best dressed volunteers in the UK, we also bring different things to National Theatre Wales from our very different backgrounds and interests. Being part of this has been hugely enjoyable. With opportunities to build on existing skills, as well as numerous chances to try out something new, my experience with TEAM is what work experience should be: an opportunity to try out a vocation and see what fits, and have a unbelievably good time doing it. What a heart felt post! :-) It certainly is TEAM and Assembly that gives National Theatre Wales it's heart! The heart of any organisation is it's people, especially those that are here for the love of it! Let's never lose that :-)) Well done on a great year for you, and a great start to a wonderful future for yourself and all the TEAM members. And who was reluctant in the Dolly Parton 9-5 sing-a-long? If my memory serves me correctly Devinda especially was having a great time! :-)) See you soon!